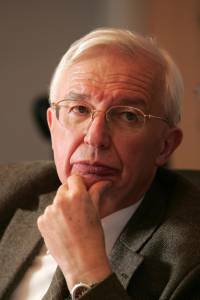 Jean-Marie Lehn is Professor at the University of Strasbourg Institute for Advanced Study (USIAS), Emeritus Professor at the University of Strasbourg, and Honorary Professor at the Collège de France in Paris. In 1968, he achieved the synthesis of cage-like molecules (cryptands) containing a cavity (crypt) into which another entity, molecule or ion of specific nature, can be lodged, forming a cryptate. This work expanded into the investigation of the chemical basis of “molecular recognition” (the way in which a receptor molecule recognizes and selectively binds a substrate), which plays a fundamental role in biological processes. Over the years these studies led to the definition of a new field of chemistry, which he called “supramolecular chemistry”. It deals with the complex entities formed by the association of two or more chemical species held together by intermolecular forces. In 1987, Jean Marie Lehn was awarded the Nobel Prize in Chemistry, together with Donald Cram and Charles J. Pedersen. Professor Lehn's work developed into the chemistry of self-organisation processes, based on the design of "programmed" chemical systems that undergo spontaneous assembly of suitable components into well-defined supramolecular species, directed by the supramolecular processing of molecular information. More recently, the implementation of dynamic features and of selection led to the development of “constitutional dynamic chemistry”, concerning entities able to undergo reorganization in response to external stimuli, thus pointing to the emergence of an “adaptive and evolutive chemistry”. Professor Lehn founded the Institute of Supramolecular Science and Engineering (ISIS) in Strasbourg in 2002. He has been involved in a large number of public and private boards and committees and also participated in several start-up companies. As president of the non-governmental International Organization for Chemical Sciences in Development (IOCD), he aims, together with a group of dedicated colleagues, to contribute to helping chemists in developing countries. He is the author of over 1000 scientific publications and two books, and member of many academies and institutions. He has received numerous international honors and awards, among them Officer of the French National Order of Merit (1993), Grand Officer of the French Legion of Honour (2014), Österreichisches Ehrenzeichen für Wissenschaft und Kunst, (Austrian Decoration for Science and Art -first class, 2001) and the Grosses Verdienstkreuz mit Stern der Bundesrepublik Deutschland (Knight Commander's Cross of the Order of Merit of the Federal Republic of Germany - 2009). G. Assanto completed in 1986 his PhD in Electrical and Computer Engineering, awarded by the Italian Ministry of Education after studies at the Universities of Palermo, Iowa and Arizona (USA). Till June 1988 he was Researcher at the Center for Electronic Research in Sicily, then Research Associate with the Optical Sciences Center at the University of Arizona, Senior Research Scientist with the Center for Research in Electro Optics and Lasers (University of Central Florida). In 1992 he became Associate Professor at the University “Roma Tre”, where established the Nonlinear Optics and OptoElectronics Lab (NooEL) and qualified in 1999 for a Full Professorship in Electronics. Gaetano Assanto is an OSA and IEEE (Photonics) Fellow; a member of the Polish Photonics Society, the Association of Novel Optical Material and Applications, the Italian Society for Optics and Photonics, the Italian Association for Electric Technology, the Italian Institute for Nuclear Physics, the (Italian) Interuniversity Consortium for the Structure of Matter, the Italian Society for Liquid Crystals, the European Optical Society and the European Physical Society. He was 2009-2011 IEEE Distinguished Lecturer (Photonics Society), Zeiss Professor at Universitat Friedrich Schiller (Germany), Honorary Professor at the University of Wollongong (Australia), Visiting Professor at Université de Nice (Sophia Antipolis) and INLN-CNRS (France), Universidad Nacional Autonoma de Mexico, Technical University of Warsaw (Poland), Universidad de Vigo (Spain), King Abdullah University of Science and Technology (Saudi Arabia), Australian National University, Texas A&M University in Qatar, 2014-2018 Finland Distinguished Professor at Tampere University of Technology. He serves or has served the editorial boards of OSA and IEEE, MDPI Materials, Laser Physics Review, Trends in Applied Sciences Research, Research Letters in Optics, Int. J. of Optics, J. Nonl. Opt. Phys. & Materials, Scientific Reports, IOP J. Optics. Isabelle Ledoux-Rak is currently appointed as Professor at École Normale Supérieure de Cachan and Head of the LPQM (Molecular and Quantum Photonics Laboratory) at École Normale Supérieure Paris-Saclay. Her current research interests include molecular and material engineering for photonic applications, investigation of gold nanoparticles for quadratic nonlinear optics and elaboration of waveguide polymer devices for sensor applications. She was recently awarded the 2015 Holweck medal from the Institute of Physics for her pioneering contributions to our understanding of the nonlinear optical properties of metal complexes, and demonstration of optical amplification phenomena at telecom wavelengths in polymer optical waveguides. She is the coordinator of the Erasmus Mundus Master course: “Molecular nano- and biophotonics for telecommunications and biotechnologies”, since September 2006. Professor Rachid Yazami is Director of Research at CNRS (French National Center for Scientific Research) and currently appointed visiting professor at the Nanyang Technological University in Singapore, was awarded on February 18, the prestigious 2014 Charles Stark Draper prize in Washington, DC, presented by the National Academy of Engineering (NAE) in recognition for his work in developing rechargeable lithium batteries 30 years ago. For engineering the rechargeable lithium-ion battery that enables compact, lightweight mobile devices. Professor Rachid Yazami received his PhD in graphite intercalation compounds for lithium batteries at France’s Grenoble Institute of Technology, and then began his career at the CNRS as research director. He has been a visiting associate in materials science and chemistry at Caltech, in collaboration with JPL/NASA, for 10 years, and in 2010 he joined the Nanyang Technological University (NTU) in Singapore as a visiting professor in materials science. His current research addresses lithium batteries and “beyond lithium” future batteries technologies, including liquid anode alkali metal-air and fluoride-ion batteries. He is a founder of CFX battery, Inc. (now Contour Energy Systems), a primary and rechargeable lithium and fluoride battery start-up in Azusa, California; director of energy storage programs at the Energy Research Institute; and principal investigator of battery research at the Campus for Research Excellence and Technological Enterprise (CREATE) Center for Electromobility, jointly managed by NTU and the Technological University of Munich. In 2011 he founded KVI PTE, Ltd., a start-up in Singapore dedicated to battery life and safety enhancement for mobile electronics, large energy storage, and electric vehicle applications. In 1979–1980 Yazami invented the lithium graphite anode, now used in commercial Li-ion batteries, a $15 billion/year business. He is listed as inventor on more than 70 patents related to batteries technology, including nano-Si- and nano-Ge-based anodes for ultra-high rate charge lithium batteries, the lithium-carbon fluoride battery for space and medical applications, and more recently liquid anodes. He has coauthored more than 250 papers on batteries and their materials and systems. He has received scientific awards from NASA, NATO, IBA, the Japan Society for the Promotion of Science, and IEEE, among others.